Today we make the leap from trikes to sidecars. Those unusual little bikes that bring to mind a lone stranger traveling across the states with his dog in the dead of winter, or the rig that is slowly putting down a country road with an elderly woman enjoying the scenery as her driver tries to keep the bumps to a minimum. Sidecars have a decidedly nostalgic feel to them. Besides early America, they also bring to mind small towns in Europe where the townsfolk move at a slower pace and the beauty of life is more appreciated. 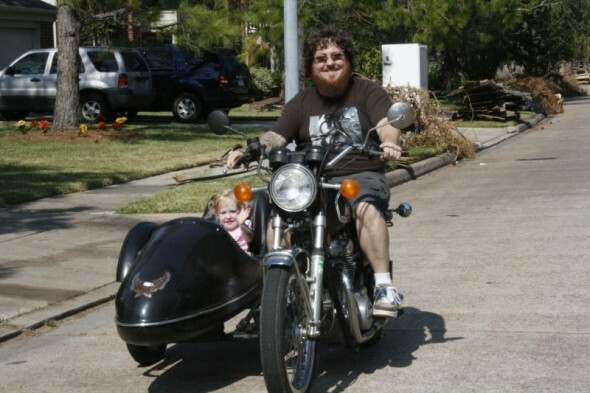 A quirky mode of transport to say the least, the sidecar is also ultimately useful. It is stable and can be run off road as well as in the snow, it has a wonderful carrying capacity and can be used to pick up and deliver items as well as a mobile vending unit, it gives those with certain physical limitations another option in enjoying the open air of a motorcycle, and your narcoleptic buddy can ride in the car and fall asleep without you worrying that he is going to fall off the back. I have just purchased my first sidecar rig and it serves my purposes perfectly. It gives me a way to take my two young daughters for a ride around the block, it gives me a nice space to stash my things on my way too and from work without having to ride with overflowing saddlebags, it also gives me a place to ride and photograph the world from a unique perspective. Besides, my Ol’ Lady rides and she can use it to get groceries and other items that she can’t carry on her two wheeler, pick up the kids from a play date, or take a couple friends for a spin to the local pub for a girl’s night out. So for us, it was a fantastic investment. Not that it was expensive by any stretch. 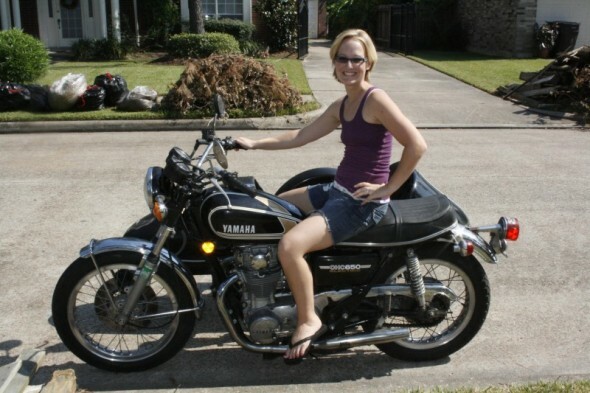 We picked up a 1975 Yamaha XS650 with an American Eagle sidecar. Nothing fancy, nothing too shiny, nothing but a fun workhorse for us to play with. 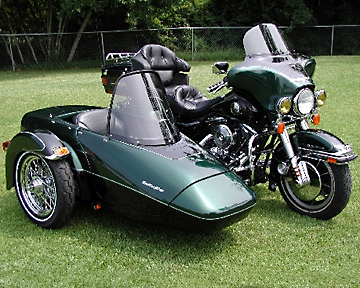 For those of you who have never ridden a sidecar rig, and I expect that is most of us, it is a very different animal. Yes, it is a motorcycle, but it steers like a car. Because of the third wheel, you cannot drive the rig with the same counter steering techniques used on a two-wheeled machine. This is really not difficult to get over, and it has not given me any trouble thus far. The thing that is a little hard to get used to is the fact that during right hand turns the sidecar, or “chair” as it is sometimes called, will “fly.” Now that sounds fun and all, but if you go into a right hand turn at any significant speed at all, the “flying of the chair” can cause a little squinting action. I am working on mastering the technique now and understand that it can be an exciting and fun thing to do when you are prepared for it. The thing that is hardest to remember is that when the car goes up in the air, you are suddenly on a two-wheeled motorcycle again and need to counter steer to keep yourself going where you want to go! Alas, I am still a newbie when it comes to these things, so I am probably not the best purveyor of advice. So, I will direct you to the authority. I just picked up a copy of “Driving a Sidecar Outfit: a manual on learning to drive a motorcycle/sidecar combination” by David Hough and published by the USCA Sidecar Safety Program, Inc. These folks have put together this manual to be used as a guide for a sidecar safety course. Because I cannot find a course in my area, I am simply walking myself through the exercises whenever I have a chance to get to an empty parking lot. I did spend some time looking at sidecars before actually taking the plunge. There are a few companies that make fantastic products out there and I would like to share these with you. 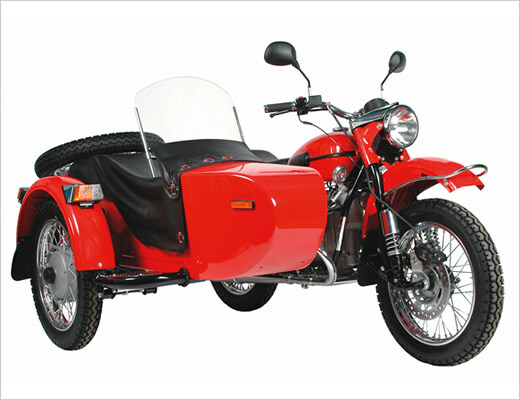 The first is probably the best-known sidecar manufacturer out there, Ural. In 1939 the USSR Defense Ministry decided to reverse engineer the BMW R71 motorcycle so that it could produce them in preparation for World War II. In 1941 the first test samples rolled out of the plant and were approved by Stalin. The “new” Russian motorcycle was labeled the M-72 and put into production. Export of the Ural began in 1953 and hit the shores of developed countries by 1960. Eventually the company was bought from the Russian Government and became privately owned. This happened in 1998 and allowed the company to grow, create better quality control, modernized design, and updated technology. We are looking at a whole new Ural here. They offer four major designs, the Retro, Tourist, Patrol, and Gear Up. Check out their site and I am sure you will find one you like. http://www.imz-ural.com/. If you are looking for something a little more tailor made, contact Liberty Sidecars in Seattle, Washington. These folks put sidecars together to fit your exact specifications. Well, they do use their own chassis and dimensions, but you can order special items like luggage racks, custom interior, tonneau cover, detachable windscreen, custom wheels, spotlight with or without turn signal, sidesteps, and more. 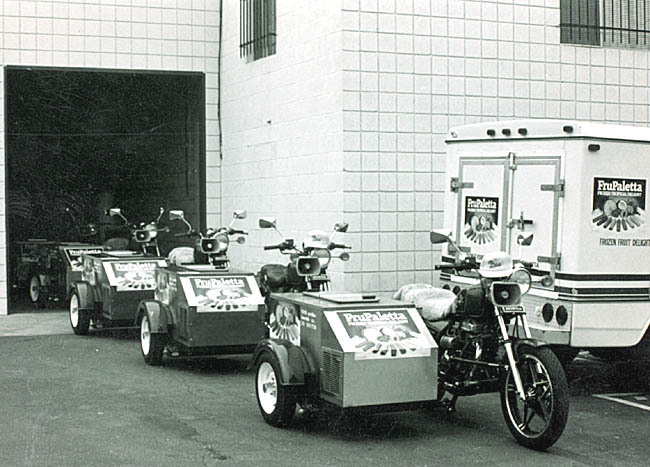 You may have seen one of Liberty’s sidecars in the movies… every see Wild Hogs? Yup, William H. Macy took a spin in one of these when he lost his bike to a member of the Del Fuegos MC. Check it all out at http://www.libertysidecars.com/. 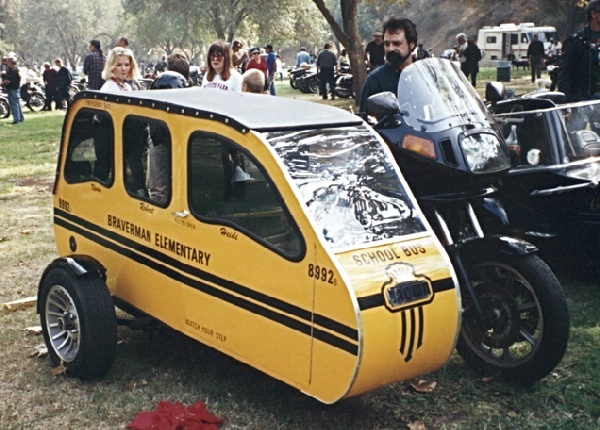 California sidecars (http://www.californiasidecar.com/) makes a pretty cool sidecar called the Friendship III. This little number fits two people in the car with its bench seat. It also has 9 cubic feet of trunk storage! What could make it any better? Well, the Friendship III has an integrated disc brake system on the car, which improves handling during braking as well as stopping time. Truly a state of the art hack. 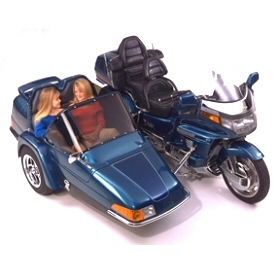 Speaking of state of the art, Spalding Side Motorcycle Sidecars has some pretty trick looking chairs. These are sleek and contemporary. Gone are the “bullet” look of the classic cars and in are the sports car front ends; you can even order one with an air scoop on the hood. These little numbers open up wide and the passengers step in rather than climb in, very upscale and really good looking. Check them out at http://www.spaldingside.com/. Sidecars, like trikes, seem to be making a comeback these days. I can’t say they will ever replace the chopper or bagger in popularity, but I certainly think you will see more of them on the roads in the near future. The utilitarian nature of the sidecar rig was one of the reasons I was attracted to them, but they are actually so fun to drive that I think I will keep one in the stable for a while. 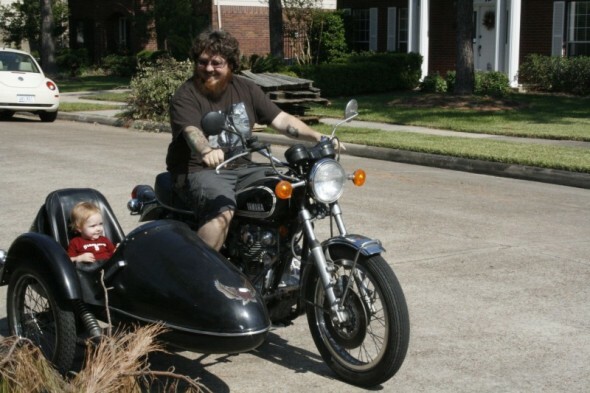 This entry was posted on October 21, 2008 at 9:02 PM and is filed under American Motorcycle, ArtBiker's Thoughts, Build Your Own, Custom Motorcycle, Harley-Davidson, Motorcycle Industry News, Uncategorized with tags sidecar. You can follow any responses to this entry through the RSS 2.0 feed. You can leave a response, or trackback from your own site.